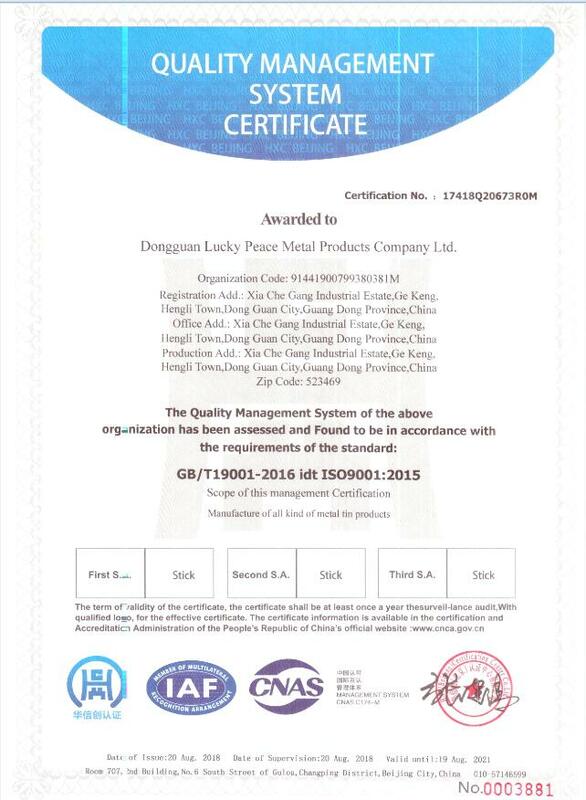 Company Overview - Dongguan Lucky Peace Metal Products Ltd. Established in 1998, Chong Shing Tin Box Manufactory Ltd. is an energetic and progressive company in the tin industry. Our factory Dongguan Lucky Peace Metal Products Factory Limited is located in Xia Che Gang, Ge Keng, Hengli Town, Dong Guan City.We specialize in manufacturing various tin products of different shapes; including round tins, square tins, rectangular tins and irregular tins. These products are widely used for biscuit boxes, confectionery tins, and gift packaging tins.Our efficient sales team is capable of providing customers with professional information. Furthermore, our factory is located in Dongguan City, equipped with hundreds of modernized machines in addition to skilled workers.Best quality is always for the first priority. Our company strictly implements in-house quality control for production lines and finished products. With our own tooling department, OEM and customers' designs are always welcomed.Please don't hesitate to contact us for more information. We can supply high quality tin box for packaging.